Gastric outlet obstruction (GOO) can be a consequence of advance stages of several disease processes. With the prevalence of minimally invasive surgery, laparoscopic gastrojejunostomy has become the preferred technique to minimize patient’s morbidity and mortality. This study aims to investigate the feasibility and safety of laparoscopic gastrojejunostomy in relieving GOO in patients with malignant and benign disease. Mount Sinai Medical Center, New York from 2004 to 2008 was performed. Patient demographics, operative details, postoperative course, and long-term outcomes were collected. A total of 28 patients were reviewed, of which 16 patients had malignancy, 7 had PUD, 3 had Crohn’s disease, and 1 had obstruction of unknown etiology. Average operative time was 170 minutes, average ASA score of 2.9, and estimated blood loss was 82cc. One case was converted to open gastrojejunostomy after encountering extensive adhesion. One case had a misfiring of the stapler. Postoperatively, the median number of days to regain bowel function was 3, and patients tolerated a clear diet on day 3 and solid food on day 5. The median postoperative length of stay was 8 days. There were 4 major postoperative complications (14%): 1 anastomotic leak and 1 trocar site hemorrhage requiring reoperation, and 2 gastrointestinal bleeds requiring endoscopic intervention. There were 5 minor complications (18%), including a partial small bowel obstruction, a patient with bacteremia, and 3 patients with delayed gastric emptying (>7 postoperative days). Only 1 patient had long-term complication of persistent GOO requiring an open jejunostomy and gastrostomy tube 3 months later. Laparoscopic gastrojejunostomy can be performed for gastric outlet obstruction in patients with advanced malignancy or benign disease with a short hospital stay and acceptable complication rate. 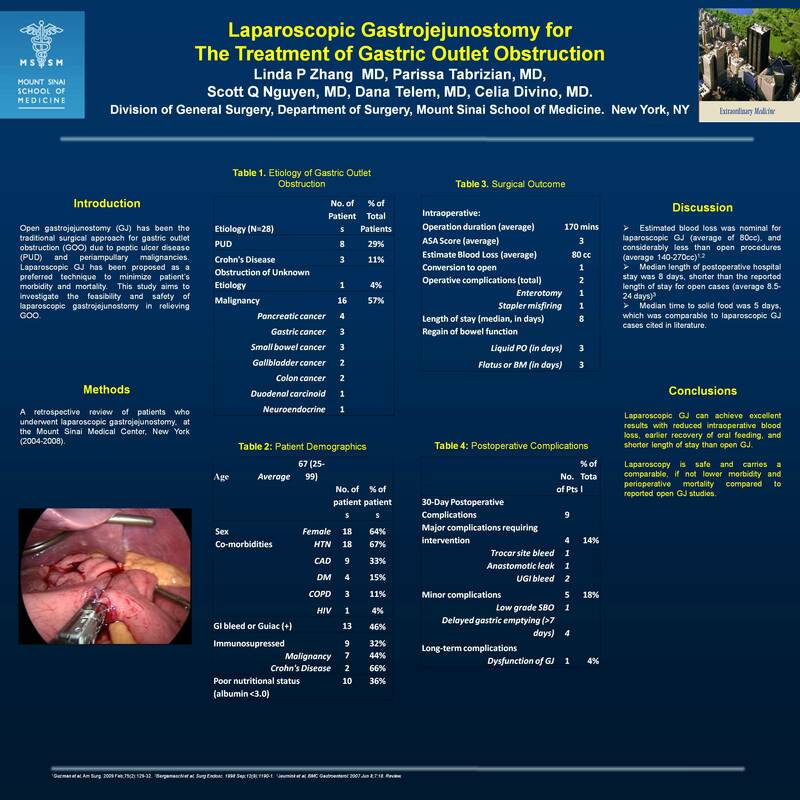 Further study should focus on case-controlled or prospective studies comparing the efficacy and safety of laparoscopic gastrojejunostomy with open gastrojejunostomy.